More than 200 research studies back up the fact that the chemical bisphenol A (BPA) is harmful for humans. Sadly, this week, our own US government passed on those studies and decided that they’d rather side with the chemical industry than our children. On Thursday, the Senate failed to vote on the passage of a bill that would have resulted, in part, in a ban on the use of BPA in baby bottles and sippy cups. According to the Wall Street Journal, on Wednesday, Sen. Dianne Feinstein (D., Calif.), facing major opposition from the chemical industry, withdrew the amendment to ban BPA in baby bottles and sippy cups from consideration. Pressure from the chemical industry, along with other major organizations, has freaked out the government and the chemical industry has gotten what they want – the privilege to keep putting BPA into baby bottles and sippy cups. Lovely. If you support Senator Feinstein’s efforts to get BPA out of baby bottles and sippy cups, please call the Capitol Switchboard at (202) 224-3121 to get connected with your Senators. Tell them that our little ones deserve the highest amount of protection possible from harmful and toxic BPA ridden products, and that they need to support a ban on BPA in baby bottles and sippy cups as part of the Food Safety Modernization Act. And until this chemical is banned, stick to BPA-free baby bottles. 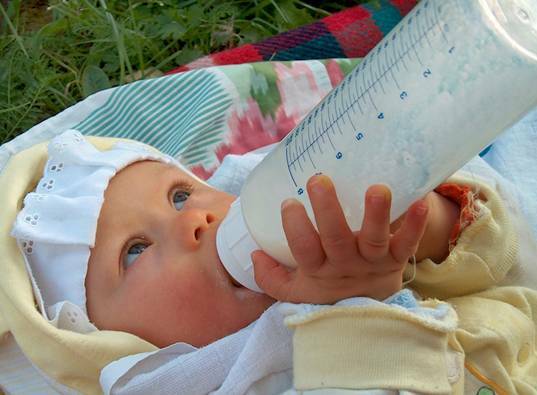 Canada banned BPA from baby bottles back in 2008 and will be restricting its use even more in the near future. I can pretty much guarantee that any American reading this post will test positive for BPA in their urine. Numerous studies have shown a very strong correlation between BPA and certain health problems. Now I don't know about the rest of you, but I would rather have the government err on the side of caution on this one. Wait, Why do we need the government to do this? I buy BPA free products now. I don't need the congress to tell me how to raise my kids. I think we need to require companies to make BPA free products. Apparently BPA is in a lot of things we don't know about. I heard that some cash register receipts use BPA - we have no way of knowing what products use it or not. Why would we want to allow bad ingredients in anything? BPA affects sperm count? That's fundamentally bad stuff... that makes what the TSA does at our airports look downright kindly. Dontask... you might not need the government to tell you how to raise your kids, but lots of people can't afford to shop where you do or buy the more expensive BPA-free options. Many don't even know what BPA is. They just buy the cheapest bottle available at Walmart or Dollar General. These people deserve to have the government looking out for them on some level. These are the same people who eat at McDonald's because they think it's cheap, and they wonder why they have diabetes and are overweight and then they burden our health care system. Yes, we all have the right to be stupid or ignorant, or even just poor, but this is a simple protection that the government needs to get behind. Plus, it's a step toward getting it out of the linings of cans that all of our food comes in. Mel, I actually started buying the cheapest bottles at Wal-Mart, $.99 a bottle, and even those are BPA free. However, I totally agree with the ban on BPA. We wonder why so many people are STC, we allow these chemicals into our bodies. It's horrible. Allowing ourselves to ingest/use these chemicals [I'm including most "FDA-approved" drugs, even!] just to suit the chemical/big drug corporations is sickening. More than 200 research studies back up the fact that the chemical bisphenol A (BPA) is harmful for humans. Sadly, this week, our own US government passed on those studies and decided that they'd rather side with the chemical industry than our children. On Thursday, the Senate failed to vote on the passage of a bill that would have resulted, in part, in a ban on the use of BPA in baby bottles and sippy cups.� According to the Wall Street Journal, on Wednesday, Sen. Dianne Feinstein (D., Calif.), facing major opposition from the chemical industry, withdrew the amendment to ban BPA in baby bottles and sippy cups from consideration. Pressure from the chemical industry, along with other major organizations, has freaked out the government and the chemical industry has gotten what they want - the privilege to keep putting BPA into baby bottles and sippy cups. Lovely.